Are you a business owner looking to take a step up in your advertising game? If so, you might want to consider a vehicle wrap. At Apple Graphics, we specialize in providing high impact visual solutions for a variety of businesses in the Philadelphia and surrounding area. High quality vehicle advertising is an innovative method of mass promotion that has exploded into the world of marketing. 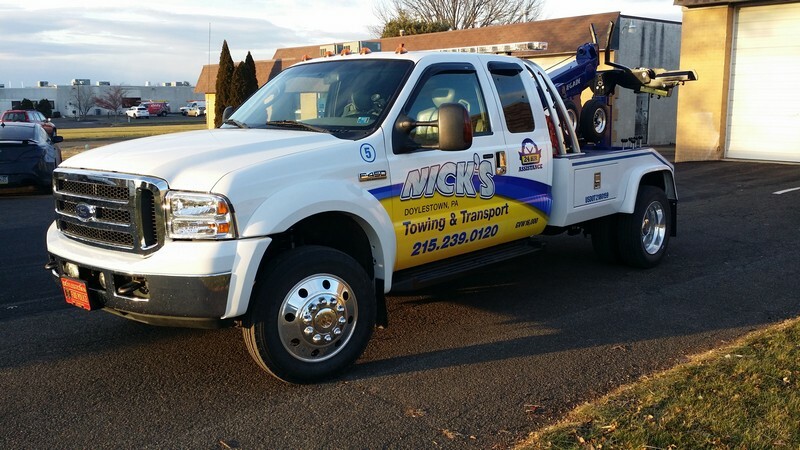 With a custom vehicle wrap, you have the potential to boost your advertising by leaps and bounds. One of the benefits of a choosing a vehicle wrap is that you can customize the look to fit your own individual preferences. A chic and creative vehicle wrap provides you with the ability to maximize your company's exposure. It also provides you with that special edge in advertising that you've been looking for. When it comes to designing unique and eye-catching vehicle wraps that get noticed on the road, Apple Graphics has it down to a science. A custom vehicle wrap gives both you and your business the personalization that will get you noticed. We can work with a wide variety of prints and textures to come up with a custom designed vehicle wrap to make your vehicle truly unique. At Apple Graphics, our goal is to deliver your message to as many of your potential customers as possible. Our top-notch design crew can help you come up with the perfect wrap for your particular needs. Wrapping your vehicle makes a bold statement and it protects your vehicle’s exterior, as well. At Apple Graphics, our technicians are ready to get you on the road in a vehicle that represents your business with style and flair. 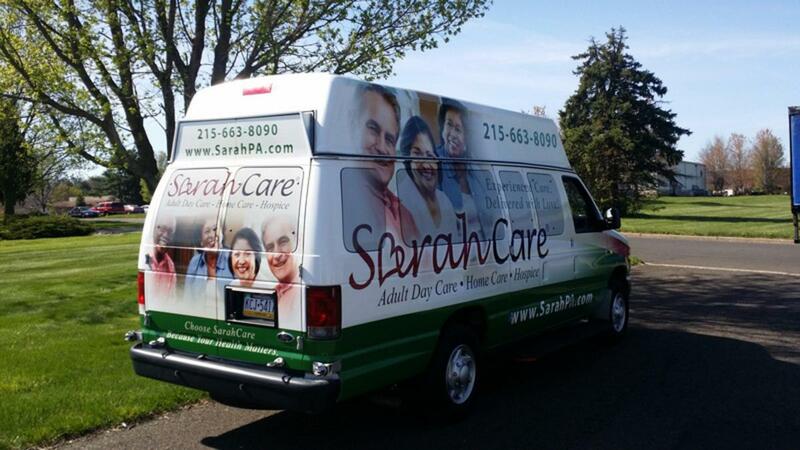 Apple Graphics is proud to serve Philadelphia and the surrounding suburbs. We offer a wide range of designs, and our wrap crew is unsurpassed in the industry. The next time you’re in the market for an advertising make-over, keep Apple Graphics in mind for your needs. Have you ever wondered if it were possible to get paid to drive your car? At Apple Graphics, you can actually be compensated for driving a wrapped vehicle in the Bucks County and Philadelphia areas. At Apple Graphics, we specialize in providing high impact visual solutions for your company in the form of wraps, signs and banners. Our “Pay to Drive” program is just one more reason why choosing Apple Graphics is a sound business decision. At Apple Graphics, we understand that there are hundreds of advertising companies looking for a way to promote their goods or services. That’s why we created our “Pay to Drive” program. The idea behind our program is that each driver will be matched with an advertiser. The way it works is that each advertiser requests a particular driving location for his or her area. Drivers will be selected based on amount of miles they drive per week, vehicle specification, and location. What better way for a business to advertise its goods or services than through our new and innovate program? Apple Graphics is the leader in mobile advertising for the Bucks County and surrounding areas. We pride ourselves on offering reliable and professional services, and we enjoy launching new programs for our clients. Our “Pay to Drive” program is just one more way for us to share our wrap services with local consumers. We give you the ability to maximize your business’s exposure, while giving you that edge that you’ve been seeking, as well. If you’re interested in participating in our “Pay to Drive” program, simply visit our website and submit your application form today. Are you looking to add a change to your car? Then why not consider adding a vibrant color change wrap to its exterior? At Apple Graphics, we offer color changing wraps with a wide selection of color film from 3M. Our professional installers use only the best materials to provide a top of the line product and services to our clients. Stop in today to see if a color change car wrap might be a good fit for your vehicle. Color change car wraps are unique because they offer a painted look and feel to your vehicle, and they also protect the factory paint and finish from the elements, such as sun, rain and snow. You can have a color change car wrap removed at any time without any damage to paint finishes, and you can choose from over a hundred varieties of colors. With so many options available, you’re sure to find a wrap color to match your particular needs. At Apple Graphics, our installers will take the time to show you how your car can be art of a complete makeover. Why not opt for a fresh, unique look for your ride? We can help you select from our wide array of color options, and leave you with a car that looks completely different from the one you drove in with. 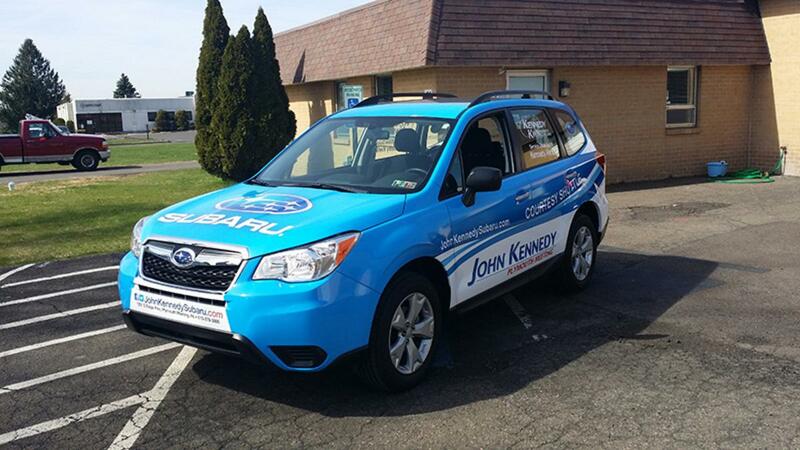 Aside from the aesthetic appeal, a color change car wrap also takes less time to complete. A paint job requires time for car disassembly, sanding, prepping, painting and then reassembly. A paint job that has more than one color application can take even longer. Do you really have to wait that long? Not with a color change car wrap from Apple Graphics. Since car wraps designed on a computer, the installation process usually only takes about an hour. That’s a big difference. If you’re looking to save money, then a color change car wrap is the way to go. Paint jobs can cost thousands of dollars, and that’s just for a one color installation. More customization and more color will cost you more. A car wrap, on the other hand, usually costs under three thousand dollars, and that’s with custom graphics included. Aside from the cost factor, the 3M vinyl used in car wraps is the same material used on billboard. There’s an added protective layer of transparent laminate that blocks UV rays. Because of this, you will never have to worry about car wax again. Washing with soap and water will make it look brand new again.